The gift of chocolate is the perfect way to tell someone how special they are, and with our wide variety of unique chocolate gifts, chocolate gift baskets, American craft chocolate bars and small-batch, handcrafted chocolate sauces, you are sure to find something to please the most discerning chocolate lover. Our selection of premium chocolate gifts has been carefully chosen from small chocolatiers around the country and around the world. You will uncover the unique and distinctive profiles of different chocolates made from single-estate cacao beans sourced directly from the growers, while the beautifully packaged gift baskets and handsomely wrapped chocolate bars make for an impressive presentation. When it's cold outside, cozy up to the fire with a warm cup of Sarabeth's Hot Chocolate Parisienne, accompanied by the award-winning chocolate peppermint crisps from Summerdown Mint. A bowl of ordinary ice cream becomes infinitely more exciting when drizzled with Fat Toad Farm's Spicy Dark Chocolate Goat's Milk Caramel Sauce. Of course, chocolate is so much better when shared! 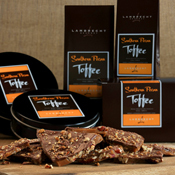 Serve handmade Southern Pecan Toffee at your next dinner party and enjoy this creamy, crunchy treat with friends. 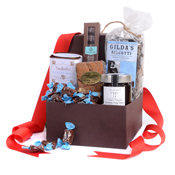 If you are looking for a gift that makes a little more of a statement (or you just can't get enough chocolate), our handcrafted chocolate gift baskets and boxes are always a hit. Our Chocolate Decadence gift box is packed with unique chocolate-y treats, including the luscious, buttery dark chocolate caramels sprinkled with French sea salt from Fran's Chocolates. 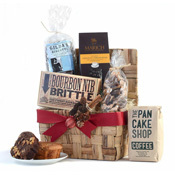 The United States of Chocolate Gift Basket takes you on a chocolate journey from the East coast to the West, including chocolate cookies, drinking chocolate, American craft chocolate and so much more. 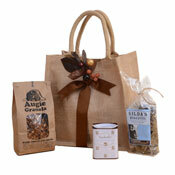 Our Chocolate for Breakfast Gift Tote is any chocolate lover's dream. Start the day with organic Dark Chocolate Chunk Granola from Augie Treats or enjoy the authentic artisan-style Chocolate Espresso Biscotti from Gilda's Biscotti. Of course, any self-respecting chocolate aficionado knows you can't have a truly chocolate-y breakfast without a steaming cup of hot chocolate, and we've included Sarabeth's Hot Chocolate Parisienne.....arguably the best cup of drinking chocolate this side of Paris. All of this chocolate breakfast goodness is presented in our reusable jute tote......a great chocolate gift, or a special treat for yourself. There's much, much more from which to choose. Chocolate truffles, chocolate biscuits and wafers, and decadent chocolate sauces are waiting to be discovered and enjoyed. Browse our selection and choose a gift of chocolate for that special someone. Or indulge yourself. You deserve it.